To be held at the Roma Administration Centre on 9 October 2013. Local Government Regulation 2012 Section 275) (h) other business for which a public discussion would be likely to prejudice the interests of the local government or someone else, or enable a person to gain a financial advantage. For the previous five years as a work-life balance initiative Council has resolved to close Council’s Administration Offices, Regional Libraries, Surat Child Care Centre and the Neighborhood Centre over the Christmas period. This report, given past practice, proposes for Elected Members to consider closing non-essential Council offices, libraries and other customer services areas for the Christmas and New Year period. In 2013 the Christmas period is a mid-week event, with Christmas Day on the Wednesday and Boxing Day on the Thursday. New Years’ Day is also a mid-week event with 1 January 2014 being a Wednesday. This report, given past practice, proposes for Elected Members to consider closure of the Council offices, libraries and other customer services areas, excluding essential services for example HACC, for the Christmas and New Year period. Given that Christmas and New Years are mid-week events, this proposal is to close from the ‘close of business’ Monday, 23 December 2013 and reopen for business on Thursday, 2 January 2014. As shown in the table below, the proposed Christmas/New Year closure period would consist of three (3) Statutory Holidays and four “closed for business” days. The proposed closure would cover the Yuleba, Surat, Mitchell, Injune and Roma Offices, all Regional Libraries, Surat Child Care and non-essential HACC and Neighbourhood Centre Services. The proposed closure would not impact on essential social services that are required to remain operation, for example HACC services in Surat and Wallumbilla/Yuleba. Communication of the closure to Council’s rate payers, customers and the general public, as minimum, should be via Public Notices placed in the Western Star, with a copy of the Public Notice, advising the closure dates, displayed at each of Council’s Customer Service Centres and Libraries. The ‘Notification of Closure’ should commence from Monday 1 December 2013. The closure would also require communication to Council employees. It is proposed that communication to our staff occur, in the first instance, by an Internal Memo sent to Directors, Managers and Coordinators for discussion with staff at Team meetings; with further communication occurring by an emailed Internal Memo sent on Wednesday 9 October 2013 and as an attachment with employee payslips. Correspondence has been received from the Applicant requesting Council to contribute to the cost of repairs needed for Mrs Wilson’s parents grave site in the Roma Monumental Cemetery. That Council doesn’t contribute to the cost of repair as all due care and respect was taken when preparing the site for burial. Investigation has found that Council staff took all due care in opening this grave, with the concrete being cut by experienced staff, and the sandstone slabs were removed by hand. The concrete foundations did show signs of deterioration as the original monument was erected over 20 years ago. Consultation with surrounding Councils (Western Downs and Central Highlands) on their methods in these cases has revealed that in these situations all responsibility for the grave monument is with the family of the deceased, and that while all care is taken, Council is not held responsible for any damage that may occur during the burial process. Our Council staff must follow WH&S guidelines to ensure that shoring is in place when digging the grave, however, this is extremely difficult in some instances as some monuments were placed many years ago (before WH & S legislation) and the room available for digging the second grave is often very limited. I am writing to confirm receipt of your e-mail, which has been brought to my attention. I will have the matter investigated and a report prepared for Council's consideration. Council meets twice per month. If possible your letter and accompanying report will go to the 24 September meeting. If there is any additional time required, we will be in contact. > purchased a double plot in the Roma Cemetery. > grave - the grave surround was still in place when Mum was interred. > complete their family grave due to a similar action being taken. > the grave was being filled not when it was being prepared. > they were filling in of the grave the surround has been cut and removed. > complete our Mum's wishes of having a tidy and respectful memorial in her beloved hometown. > We have attached copies of the photos for your perusal. This report provides a copy of confirmed meeting minutes of each of the advisory committees that held meetings during the months of July/August 2013. Council initiated advisory committee meeting minutes are circulated to Councillors on a monthly basis to ensure Council is aware of committee items discussed, and subsequent actions and recommendations put forward by each Council initiated Advisory Committee. The most recent confirmed minutes of each of the committees that have convened during the months of July/August are attached. Attendees: Kevin Chambers, Robert Nugent, Sarah Holt, Jacki Erickson, Ian Galloway, Gabrielle Barron, Tyson Golder, Linette Chandler, Jim Scott, Gary Schefe, Cr. Cameron O’Neil, Cr. Peter Flynn, Tony Klein, Kym Downey, Katrina Marsh, Kelly Rogers. That apology be received for Katrina Marsh & Justin Garvie for the meeting. It was requested Council provide feedback to TMR feedback concerning the safety of bottle trees being sold outside of a residence (in a trailer) on the Warrego Highway, Roma. Katrina Marsh to provide additional information concerning Council’s responsibilities with respect managing identified fire hazards in the Roma CBD. Kelly Rogers to circulate a template for capture of ideas for collation of a ‘Wish List’ from the committee. Committee Members complete the circulated template and return to Kelly Rogers for compilation. Chair to confirm formalised process for submission of committee requests/recommendations for presentation to full Council for further consideration. Barry Winter of Queensland police Service be invited to attend the next committee meeting. The Chair formally put forward for Council’s consideration the committee’s recommendation that “Council introduce regulated on street parking for the whole of the area identified as the “CBD,” with a maximum allowable parking period of three (3) hours. The Chair formally put forward for Council’s consideration the committee’s recommendation that “That Council considers immediately introducing a 40km/hr speed limit in the Roma CBD. That Council Staff further investigate the trucks avoiding turning at the KFC corner and using non-designated roads within the CBD as an alternate route. That the Roma CBD Advisory Committee Meeting Minutes of 4 June 2013 be confirmed. That the Roma CBD Advisory Committee Draft Terms of Reference be adopted as presented. The group requested an update on presentation of their formal request to Council - that the demolishing of the existing public toilets be placed on hold, and for the existing block to remain operational in addition to the new amenity block. Chair, Cr. O’Neil, advised the group that the process of formalising of Advisory Committee Recommendations was under development. As soon as this was finalised this recommendation would proceed formally and an update provided to the group. · Larger space could incorporate a precinct for kids, arts, water space, markets, play space, alfresco dining. Chair advise the group that in the instance of regulated parking being introduced, Council would enforce regulation through local laws. That Council consider the introduction of regulated on street parking for the whole of the area identified as “CBD,” with a maximum allowable parking period of three (3) hours. It was generally agreed by attending members that safety concerns be mitigated with the introduction of a reduced speed limit in the Roma CBD. That Council considers immediately introducing a 40km speed limit for motorists travelling in the Roma CBD. Members had observed trucks avoiding turning at the KFC corner for alternate routes in the Roma CBD, and requested this be further investigated. That Council officer’s further investigate trucks avoiding turning at the KFC corner and using non-designated roads within the CBD as an alternate route. Advise the committee of the outcome relating to the General Aviation Parking. Provide a date of when Nektar Remote Hospitality plan to commence operations. Advise the committee of the commencement date of the contract with Nektar Remote Hospitality after the delay in signing the finalising the contract. Feedback to unsuccessful local tender applicants. Minutes for the previous meeting were provided to committee members to review prior to the commencement of the meeting. Cr. Denton tabled the minutes as true and correct with no amendments required. Ben Jones provided the committee members an outline of the data used by Airport Management to determine the impacts of aircraft movements on the runway and the predicted pavement life of the current runway at Roma Airport. This information is based on the average weekly aircraft movements. Ben showed specific information outlining the BAE146 at its normal operational weight compared to the adjustments that have been made by Vincent Aviation to meet the requirement for the Roma Airport. The committee discussed what factors the spreadsheet takes into account, such as increased flights, aircraft maximum takeoff weight as apposed to what the aircraft actually weighs once it lands and factors such as soil quality. Ben explained that the database is a very simple tool, which only accounts for one method of pavement failure. However it provides valuable information which works in conjunction with the numerous daily serviceability inspections and continual maintenance of the pavement. This allows Airport Management to determine an estimated time frame for when a new pavement overlay may be required in the future and budget accordingly. Council has placed revenue from airport landing fees into a separate account to cover the cost a new overlay when the pavement life has been reached. Ben provided an update on the availability of parking spaces in the General Aviation area. Both MI Helicopters and Barry McCabe on behalf of the Aero Club have provided feedback. Meryl Brumpton provided feedback during the discussion that 4-5 spaces would be sufficient to cover the needs of the Flying Surgical & Flying Obstetric Service. Representatives for Careflight and Royal Flying Doctors Service will be available to speak to next week. The committee decided to expedite the process the best course of action would be for Airport Management to collate all information provided and present to Council to finalise a decision on the car parking facilities. The committee can be advised of the outcome at the next meeting. Ben outlined that the repair of the Mitchell Airport fence was approved in last year’s budget. Ben is currently awaiting quotes from fencing contractors to repair the fence and will update the committee as this progresses. Ben updated the committee as to the incident at the Surat Airport, where an RFDS pilot could not activate the lights at the airport when trying to land and as a result had to be turned away. The lights were not able to be activated on the ground either and there was no electrician available in town to resolve the problem quickly. Upon investigation it was found that there was an electrical fault that meant there was no way for the lights to be activated until they were repaired. This has been completed and processes are being put in place to monitor the lighting system in future. Council staff will complete a weekly check of the lighting system, and an air band radio is being purchased for the Surat Airport to allow the lighting check to be completed through the Pilot Activated Lighting (PAL) system. The committee discussed backup options to prevent this situation occurring again. It was suggested that a backup generator for each airport would be beneficial in the instance that there is no possible way to activate the PAL system, or the use of kerosene flares would also be beneficial. Meryl Brumpton enquired if the testing procedure will be completed at all airports operated by Maranoa Regional Council. Ben advised that staff would be completing the Airport Reporting Officer (ARO) training to allow this procedure to be rolled out at all Maranoa Regional Council Airports. Ben advised the committee that the lease negotiations with Nektar Remote Hospitality for the Airport kiosk have been finalised and should be signed be Nektar tomorrow. There is a 7 day cooling off period before Julie Reitano can sign the contract. It will be approximately 6 weeks before operations commence. The committee discussed the delay in the commencement of the kiosk at the airport and that local applicants had been unsuccessful in the tender process. The committee would like to see a local applicant successful in future, as local business are also more inclined to source local products which is beneficial for everyone in the area. Concern was also raised as to when the current contract with Nektar actually takes effect, due to the delay in the contract being finalised. Ben advised that he will investigate this and advise. Gary Schefe requested feedback for unsuccessful tender applicants, to use as an educational tool for future tender applications. Ben advised that he will write to all local applicants that were unsuccessful and outline areas in their application that could have been improved to help local applicants. Ben updated the committee on the water leak around the Aero Club that had been brought forward in a previous committee meeting. The leak was found to be a faulty pipe and not from the sprinkler system. Airport Management have had the pipe fixed and will monitor the area to ensure there are not further leaks. Barry McCabe thanked Council on behalf of the Aero Club for resolving this issue. Ian Rollinson asked for feedback on the Surat Airport runway upgrade? Ben advised that all works were completed. Line marking will be completed within the next few weeks. Gary Schefe asked for information on the inclusion of retail outlets in the master plan of the proposed terminal redevelopment. Ben outlined that a retail area has now been included, and that once a detailed design of the terminal is completed a size for the retail area will be decided. Ben sought feedback from Gary as to if he or anyone from Commerce Roma had a proposed idea of what floor space would be adequate. Gary responded that the area does not have to be large, approximately 3-4m with petition walls and a door so retail outlets have the ability to lock away merchandise when not present. Gary offered to consult with Commerce Roma and other local business to seek expressions of interest to gauge how many outlets may be required. Gary will provide feedback resulting from the expressions of interest to Ben by 16th August 2013. Peter Flynn stated that the terminal is beyond capacity and as a result passengers are struggling to get checked in and find seating in the terminal. The committee discussed possible ways to expedite the process of the terminal redevelopment to resolve this solution and temporary solutions to ease passenger congestion until the terminal redevelopment is complete. As one of the areas that experiences high passenger numbers is the check-in counter the committee discussed opening the third check-in counter to allow passengers to pass through this area quicker. The committee proposed that opening of the third check-in counter should be made a priority to ease passenger congestion in this area. Lyn Kajewski enquired as to the success of having tourism brochures available to passengers at the terminal. Ben advised that we have refilled the stands a few times, so people are taking note of the brochures and taking them. Lyn also advised that we should speak with Jenny Hewitt from the Tourist Information Centre, as she has some very useful information for tourism promotion. Gary Schefe added that the Focus on Roma brochure would also be of interest, these can be organised through Camille Johnson. Ben advised the committee that the screening point recently underwent a systems check by Office of Transport Security (OTS). The test was concluded as a null and void result due to equipment fault, however the screening staff were still successful in initially indentifying the object and following procedure. Meeting minutes from previous meeting 27/06/2013 were confirmed at 2.40pm. Ashley Page from the AEC Group and Owen Kleidon from StruXi Design presented in regards to the Saleyards Master Plan project. From significant research and stakeholder engagement the project aims to develop a detailed Master Plan and associated costing for the future commercial and operational development of the Roma Saleyards. Owen Kleidon has been speaking to local businesses and looking into what drives Roma, what are the main business types and would some business relocate to the Saleyards if the facilities were available to operate. Owen will be investigating the feasibility of a conference facility, office with meeting rooms and agent offices, possible information centre and facility tours to entice tourists. Ashley Page asked the attendees for their outlook/ideas in relation to the Master Plan. Saleyards to be better utilised, strategic development, to aline with the industry, profit could be used as capital upgrade (reduce pressure off selling fees which is the users main concern), first and foremost the primary role of the facility is a Saleyards. Very efficient Saleyards, higher volume might mean lower costs, it would be good to get access for type 2 road trains, and the most important thing is that at the end of the day the primary role of the facility is a Saleyards. Reserve land for compatible usage. Getting rid of the powerlines – will lead to better access, the truck wash is not being used to the best of its abilities (should do something within 18 months – 2 years). Use of the truck wash is 40% transport 60% coal seam gas trucks/workers. Vendors will always be looking at the costs. The next stage of the project plan is the Concept Workshop. Larissa Pears will liaise with Ashley Page to organise workshop. Handout provided from the Maranoa Regional Council Meeting minutes listing the endorsed membership list of the Committee effective from the 1 August 2013. Handout provided, Terry Hyland explained the important aspects discussed at the ALMA General Meeting. Handout provided of Sales Figures of total sales throughput for January to July 2013 compared to January to July 2012. No smoking signs are going up near all building entrances and exit as smoking is not permitted with 4 meters of building entrances or exits. Organic Spelling is not a viable idea from Birdsville due the limited number of suppliers. The next Saleyards Advisory Board meeting will be held on the 29/08/2013 at 1.00pm – 2.30pm. Meeting was closed at 3.00pm. Attendees: Kevin Chambers, Sarah Holt, Jackie Erickson, Gabrielle Barron, Tyson Golder, Linette Chandler, Jim Scott, Gary Schefe, Cr. Cameron O’Neil & Kym Downey. That apologies be received for Cr. Peter Flynn, Ian Galloway, Robert Nugent, Katrina Marsh and Tony Klein, Jackie Erickson & Gary Schefe for the meeting. Kelly to collate wish list specifications, and provide to the appropriate officer of Council for technical comment. Full list to be circulated to members with the Agenda of the next Meeting. That the Roma CBD Advisory Committee Meeting Minutes of 30 July 2013 be confirmed. Chair, Cr. O’Neil provided members an update of the outcomes of committee recommendations submitted to full Council for consideration. 2. The appropriate Council officer (Manager – Facilities) undertake a review of Subordinate Local Law Number 5 (Parking) and amend where necessary for Council’s approval to support the implementation of regulated parking in the Roma CBD. Members undertook a workshop to clarify items contained on the wish list. Outcomes of these will be provided as separate documentation and categorised under 4 key themes – Car Parking Availability, Pedestrian & Motorist Safety, Enhancement of Visual Appeal, Creating Community Meeting Points. Kevin Chambers and Kym Downey provided members an alternative design for the mid street crossings. Those present were generally in favour of the proposed design. Further work will be completed on the design to and bought back to the committee next meeting. Those present also discussed the possibility of signage being placed identifying entrance to the CBD. This will be included on ‘Wish List’. This may also assist with encouraging trucks to avoid the CBD. Chair, Cr. O’Neil advised members that Council will undertake a staged approach with implementation of regulated parking in the CBD and the Roma Placemaking Plan. Milly Chandler provided a sample design of a metal sculptured bottle tree for group viewing. The Financial Management Report for the period ending 18 September 2013 is presented at a high level (Refer Table 1 – One Page Summary 2013/14) against Council’s approved budget 2013/14 for Council’s consideration. The overall result is a deficit of $10.6M. Majority of this amount relates to recoverable works, $8.5M is to be claimed for flood restoration works and a further $2.0M on Main Roads Contract works. That the Financial Management Report year to date 2013/14 be received. At a high level, the following table shows the 2013/14 actual figures year to date versus Budget 2013/14. · Council’s rates notice for the first half of the financial year has been raised and posted to the general ledger and included in this report. Revenue from general rates amounted to $8.5M which is approximately 50% of the annual projection. The Rates Contractor advises of the intention to send out rate notices on 25 September 2013, with the due date being 25 October 2013. · Council received Federal funding from Roads to Recovery in mid-August 2013 of $4.6M. An amount of $1.4M relates to this financial year’s capital expenditure and the balance of $3.2M relates to costs incurred from prior years and including 2012/13 financial year. · Council so far has spent $1.8M on roads infrastructure. An equivalent revenue amount has been recognised to cover capital projects that are externally funded such as Roads to Recovery. Reserves transfers have not been accounted for year to date. It is intended to have all transfers to and from reserves completed in line with the quarterly budget reviews. Strategic Finance is in the process of updating the QTC financial model. This is a critical medium used by Queensland Treasury and QTC in assessing Council’s financial capacity to service the loan in the long term. The first quarterly payments on existing loans have now been paid and are accounted in this report. In the August report we highlighted that Officers are reviewing a number of recorded transactions. The issues identified relating to those transactions has been rectified. The report presents Council’s financial results for the year to date at a high level. More detail will be provided once year end is finalised and budget reports for the coming year are set up. This report recommends to Council the formal write-off/write-on of quantities and values arising out of Council’s stocktake of its Stores inventory items as at the 30 June 2013. That Council approve the write-off/write-on of the quantities and values of those store inventory items identified as requiring adjustment, after the completion of the stocktake undertaken in June 2013. Council undertook a comprehensive stocktake of its total inventory stockholdings during June to validate physical stock held against recorded quantities and values in Council’s accounting records. An outside quantity surveying company Bennett and Bennett were engaged to undertake the stocktake of Council’s gravel and other products at Council’s main quarry and at Council’s various depot locations throughout the Maranoa Regional Council area. Council staff undertook the stocktake of inventory held at Roma Depot, Mitchell Depot , Surat Depot , Yuleba Depot and Injune Depot as well as Council’s water store in Roma. The detailed results of each of these physical stocktakes as well as their reconciliation with Council’s accounting records disclosed an aggregate difference of $1,384,668.45. Attachment A refers. Last financial year’s stocktakes culminated in an identified shortfall of $3,585,542.72 , the majority of which appeared in those items that are road construction and maintenance material items. As stated at the time the current system is reliant on staff providing the appropriate information to stores personnel to account for movements/use of such items. Processes , procedures and general accountability is now currently being enhanced to ensure there is more effective controls over the use of these items however there will be further instances until there has been a complete transition at an organisational level. Consequently the aggregate discrepancy between Council’s recorded stock and physical stock as at 30 June 2013 amounted to a further discrepancy shortfall. There were a number of inconsistencies identified in last year’s stocktake calculations that have been rectified and adjusted as part of this year’s stocktake calculations. Overall it is considered that these costs if transacted appropriately would have been reflected in Council’s project costs however can now only be treated as a write-off cost of stock inventory. There are security issues surrounding stores stock particularly in relation to soil/gravel type material where it is not secured at many sites. This matter is being addressed in the current initiatives being undertaken jointly by Infrastructure and Financial Services – Procurement and Stores staff. The stocktake of general stock items apart from soil/gravel type material at the 30 June 2013 revealed only a aggregate variance of $16,587.96. This figure is reflected in the overall reported figure stated above. Fuel stock records at Injune have culminated in considerable fuel usage not being able to be identified as no paper work to record issues had been completed by field staff for a considerable time period. This matter has been rectified and stores staff are now attending to this site at weekly intervals. With respect to emulsion stocks at Roma identified to be written off, these stocks are not able to be used due to their age and state. Emulsion stock values at Yuleba to be written off are the legacy of stock not being booked out correctly to jobs. Council is required to comply with the Australian Accounting Standards as well as the legislative provisions as prescribed under the Qld Local Government Act 2009 (as amended) and the Qld Local Government Regulations 2012 in its accounting records of Council’s conducted business. As well Council is subject to audit of its financial transactions during the financial year. Nil. Council’s current policies are consistent with the relevant state legislation and Australian Accounting principles. Council has made provision in its 2013/14 budget to undertake and implement a more integrated management system of its stores and procurement processes which it is envisaged will substantially address the operational and accounting deficiencies currently inherent in Council’s operating systems and practices. Pages to be provided to Council at the meeting. Council has received the Mitchell and Amby Flood Mitigation Studies, Stage 1. The reports contained several recommendations to reduce the flood risk and increase the flood resilience of the townships. BMT WBM, the firm engaged to conduct Stage 1 of the study has now submitted proposals for Stages 2 & 3 in both towns. Council has received funding to a maximum of $300,000 to investigate flood mitigation options in Mitchell and Amby. Stage 1 in both towns cost about $140,000. Stages 2 & 3 cost is estimated at $154,930, totalling about $294,930. This will be fully funded. The objective of Stage 2 in both towns is to test three structural flood mitigation options, seeking to reduce the impact of flooding in the 1% AEP (Annual Exceedance Probability) design flood event. This will give an initial understanding of the likely scale of any structural mitigation. The review will recommend a single preferred option to take forward for more detailed consideration in Stage 3. The objective of Stage 3 in both towns will be to test the preferred alignment of the structural option to consider its impacts in flood events greater or smaller than the 1% AEP event and consider wider floodplain management impacts such as the residual flood risk which will remain. It is expected the process would take approximately three months to complete. Fully funded from grant monies. 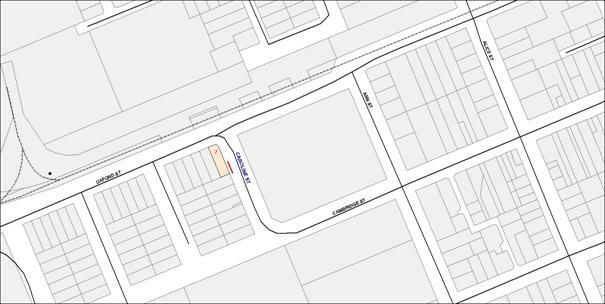 Council has received a request to construct a dust seal on Pinelands Lane, Mitchell. 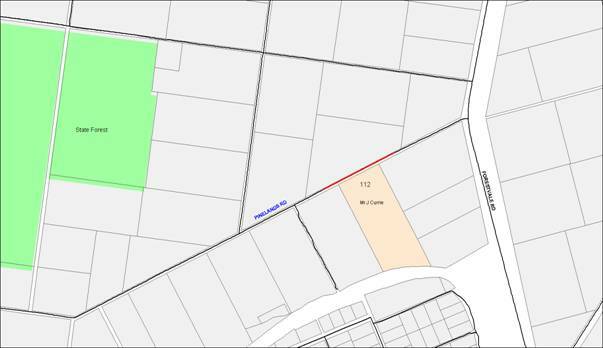 Council has received a request from Jason Currie to construct a dust seal on Pinelands Lane, Mitchell. Mr Currie has stated that he is building a new home 23 metres from the road and has identified that traffic, including trucks, cause a cloud of dust over his residence and is concerned about the associated health risks. An inspection was completed on 12 September 2013. It was observed that a shed and water tank has been constructed on this property located at approximate chainage 0.80. The lane has recently received a gravel resheet to 6m wide, and is in good condition at this section. The section of Forestvale Road that intersects with Pinelands Lane has a 5.6m seal. A 200m long seal with a 6m with standard has been adopted for the cost estimate. Capital Cost of $13,332.00 (or $6,666.00 as per Dust Seal Policy) and an annual increase of $234.55 per annum in maintenance and renewal costs. Thank you for your Customer Request Form dated 30th August 2013, outlining your request for bitumen seal in front of your property on Pinelands Lane. I have undertaken an initial review of your concerns and have allocated this matter to Kylie Fleischfresser (Coordinator Infrastructure Planning) for further investigation. Following this investigation a report will go to the Council meeting of 25 September 2013 for resolution. Please do not hesitate to contact Clara Aitken of my office on (07) 4624 0712, or by email – clara.aitken@maranoa.qld.gov.au, if you have any further questions or concerns with progression of this matter. That Council suggest and adopt a name for the road currently referred to as No 2 Off Swans Road. Council has received a request from John & Belinda Gilliland for a rural addressing number for their property near Wallumbilla. However the road, located off Swans Road, is currently unnamed and is required to be named before a rural addressing number can be provided. The road is currently referred to as No 2 Off Swans Road. There doesn’t appear to be a naming convention for roads in the surrounding area. It has been suggested by the Coordinator – Roads & Drainage North (Yuleba/Wallumbilla) to have this section of road as a continuation of Mount Leigh Road, however this may not be suitable given the road is at a right angle to the existing Mount Leigh Road. Mr & Mrs Gilliland also advised that this road has been referred to as Mount Leigh Road by local residents. Further suggestions are to name the road Mount Leigh West Road or Leabrae East Road in reference to the adjoining roads (the road is unable to be named Leabrae Road as this would affect existing Rural Addressing). It is proposed that Council suggest and adopt a name for this road. Road name sign will need to be installed. Council has received a request from Graham Allen that Council construct a footpath outside the Mitchell Motel, located between the motel driveway and the phone box on Caroline Street, Mitchell. An inspection was completed 12 September 2013. The section was measured to be approximately 21m in length. 1.5m is the typical width for footpaths in Mitchell and this has been adopted as the standard for the cost estimate. Construction of the footpath would benefit motel and diner workers and patrons. Capital Cost of $4,725.00 and an annual increase of $315.00 per annum in maintenance and renewal costs. Thank you for your telephone call and e-mail correspondence with Clara Aitken (Support Officer-Infrastructure Planning & Design) on 5th September 2013, outlining your request for a footpath along a section of Caroline Street. Firstly we apologise that it has taken so long to update you on this matter which you advised was initially raised some time ago. I have undertaken an initial review of your request and have allocated this matter to Kylie Fleischfresser (Coordinator Infrastructure Planning) for further investigation. Following this investigation a report will go to the Council meeting of 25 September 2013 for resolution. The Injune Community Partnership has proposed a name change for the building known as the ‘Injune Youth Group Building’ and previously as the “Old Visitor Information Centre’ located 41-45 Hutton Street, Injune being on part of Lot 3 on Plan 171817. Council has received a letter from Injune Community Partnership requesting the renaming of the Injune Youth Group Building to Injune Community Centre. Currently a Commercial Tenancy Agreement is in place between Injune Youth Group, Injune Swimming Club, and Queensland Blue Light Association Injune. The agreement between Council and Blue Care Injune is still being finalised. At a meeting held between the lease holders on 7 July 2013 it was discussed that the name of the building be changed to ‘Injune Community Centre’ as they believe this name will encourage other community organisations to utilise the building. The lease holders have also indicated they would be willing to work on the changes to the new sign in consultation with Council. Additional clarification was sought on Council’s resolution of 11 September 2013, which provided authority for Council to set a prescribed fee for Council and or its authorised agent to implement a clean up process for a section of stock route at Wallumbilla that has the potential to have an approximate cost recovery fee of six thousand dollars ($6,000). In the original resolution set by Council, items (a) and (b) above were inadvertently omitted from the resolution. Nil once included in the resolution. Should due process not be followed, it has the potential to be an unbudgeted expense to Council.